This study investigates the effects of human capital, social capital and their interaction on the performance of 1,398 Vietnamese new-born firms. Operating profit is used as the measure of success. Human capital is captured by individual-level professional education, start-up experience, and learning. Whereas the first two dimensions of human capital are measured with traditional indicators, we define learning as the ability to accumulate knowledge to conduct innovation activities (new product introduction, product innovation and process innovation). Social capital is measured as benefits obtained from personal strong-tie and weak-tie networks. 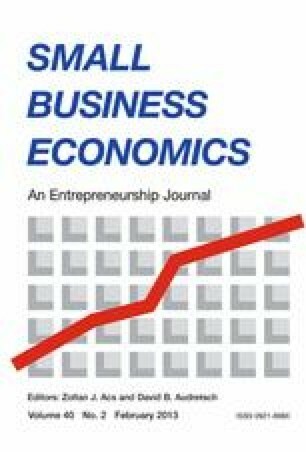 Key findings are threefold: (i) human capital strongly predicts firm success, with learning exhibiting a statistically significant positive association with operating profit, (ii) benefits from weak ties outweigh those from strong ties, (iii) interaction of human capital and social capital displays a statistically significant positive effect on new-firm performance. We are grateful to two reviewers for their helpful suggestions. Enrico Santarelli acknowledges financial support from University of Bologna (RFO 2009). Koch, B. J. (2005). Social capital in China: An experimental approach. Paper presented at the 100th Annual Meeting of the American Sociological Association (ASA). http://www.allacademic.com/meta/p20678_index.html. Accessed 21 August 2008.